Why Shop at Baby Mall? Moms prefer buying all their baby essentials at Baby Mall Online - for a lot of good reasons! 1. All baby products and baby clothes on Baby Mall Online are NEW items - the prices are low, even for newborn clothes, but rest assured that all products are brand new! We never thought this would be something to be addressed, but we have had the occasional inquiry as to whether our infant clothing is new, from the clearance floor, or in some other way sub-standard. And all because our prices were so low! To settle the matter firmly, please let us repeat that ALL of our products are NEW and UNUSED. They do not represent the leftovers of some manufacturing floor somewhere and are not in any way sub-standard! 2. Newborn and Infant clothes are normally in stock and ready for immediate shipment. 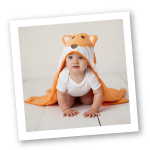 Baby Mall Online is able to maintain a steady supply of over 500 baby clothes and baby care items! All of our infant clothing is shipped to you from our location in Poughkeepsie, NY where all styles, colors, and sizes are available in large quantities. It is really very rare that we run out of stock! On the occasion that we run low on an item you ordered, we will be happy to contact you to offer another great alternative. 3. Your credit card transaction for your infant boys / girls clothes is safe and secure, and we work hard to get your order out as soon as possible! Baby Mall Online offers a convenient and easy shopping experience, and all our baby products on our site are protected by SSL security. During checkout you'll see a hovering red triangle from Comodo that provides more security information for your peace of mind upon mouseover. We ask that you allow up to 2 days of processing time, but usually we get your baby clothes orders out the next day. We never want to disappoint so we have stated a comfortable fulfillment window for even the busiest times. 4. Baby gift items and infant clothes are available in clearly visible color options for each product. 5. Baby Mall Online has a fair and convenient return policy. Baby Mall Online is committed to making sure our guests are completely satisfied with their purchase. We have a simple return policy to make your shopping experience convenient and comfortable. Please review our Shipping & Returns page for more details. 6. We want to hear from you and we offer several ways for you to reach us! Our guest service personnel are familiar with all of the baby clothes and baby care items that we offer, and they are always here to help you. You can reach them by filling out the contact us form, clicking on chat with us button below, sending an email to customercare@babyvision.com, or calling 845-473-6780, extension 100 at any time. We are available to respond to your inquiries Monday - Friday from 8 am - 5 pm EST and will always make getting back to you our priority.